Surprise, surprise. More from Bill Granger's Every Day. 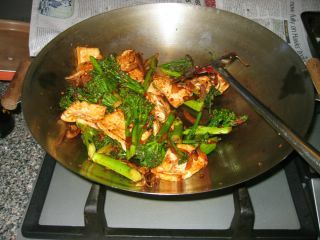 This one is a tofu and broccolini stir fry. To make it, you fry off slices of tofu, and set them aside while you stir fry onions, broccolini, garlic, sambal oelek and soy sauce. Easy peasy. It takes like 10 minutes to make (including chopping - so if you're having rice, make sure to turn the rice cooker on in advance! ), and is quite tasty and very satisfying. The only problem I found with it was that it wasn't hot enough, but I like my food crazy-hot. Next time I wouldn't use supermarket sambal oelek, but I'd use the sambal that my mum makes up from blachan paste and teensy-weensy super-hot chillies, Malaysian-stylie. Shiok! Supermarket sambal is never as good as homemade.. There's something about pounding it all yourself that gives it a special flavour.